JACKSONVILLE – Wide Receiver Karel Hamilton (6’1”, 205) has signed with the Sharks for his rookie season of arena football and first with the Sharks. Prior to signing with the Sharks Hamilton was a NFL undrafted free agent that competed for a roster spot with the Dallas Cowboys and Cincinnati Bengals during the 2017 and 2018 seasons. 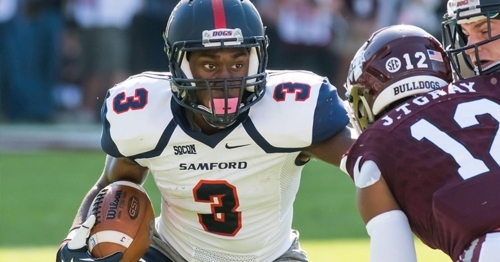 Hamilton spent his college career at Samford University (2013-2016) and was the Bulldogs All-Time leading wide receiver currently holding the school career records for receptions (279), receiving yards (3,803) and touchdowns (31). At the end of the 2016 season, Hamilton was named first team All-Southern Conference for the third-straight season. He was also named All-American by the American Football Coaches Association, Associated Press, Hero Sport, STATS and Athlon. Hamilton is a native of Valrico, FL and attended Strawberry Crest High School.